Deric's MindBlog: Increases in stress and amygdala volume reversed by mindfulness meditation. Increases in stress and amygdala volume reversed by mindfulness meditation. Figure - Chronic stress causes neurons to shrink or grow, but not necessarily to die. Representation of the chronic stress effects detected in animal models on growth or retraction of dendrites in the basolateral amygdala and orbitofrontal cortex (growth) and in the CA3 hippocampus, dentate gyrus and medial prefrontal cortex (shrinkage). These effects are largely reversible in young adult animals, although aging appears to compromise resilience and medial prefrontal cortex recovery. 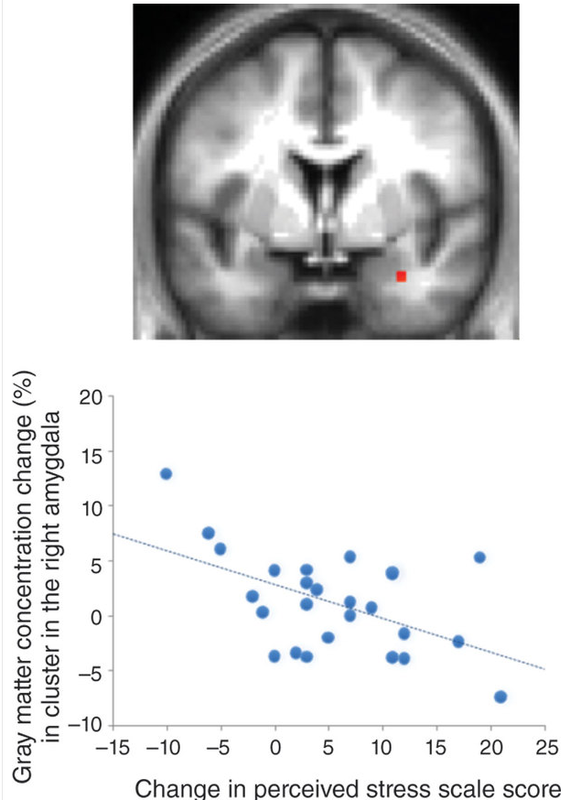 Figure - Change in gray matter volume in the right basolateral amygdala from pre to post 8 weeks of mindfulness based stress reduction was associated with decreases in perceived stress over this same time period (see Hölzel et al.). Individuals undergoing MBSR who showed the largest decreases in perceived stress also showed the largest decreases in basolateral amygdala gray matter volume. I would agree that meditation is best in treating stress, I don't rely on medicines, I treat stress naturally using natural methods. Most of the time, I only need to rest and also with meditation. I agree with you completely, it has been known for many years and meditation are highly recommended to stay strong and healthy. you can also try the reiki which is the essential key to protecting clean alongside stimulating to mind and body. Reiki India is discriminating to use to help revive your interior additional issues. Reiki classes in Chennai are typically respect to individual upgrade alongside create profitable referrals for the life time.